I have been off the grid for a bit, but more importantly, I have been on vacation. With some old and some new friends, I hiked the Inca Trail through the Andes mountains from outside Cusco, Peru to the oft-photographed Machu Picchu. 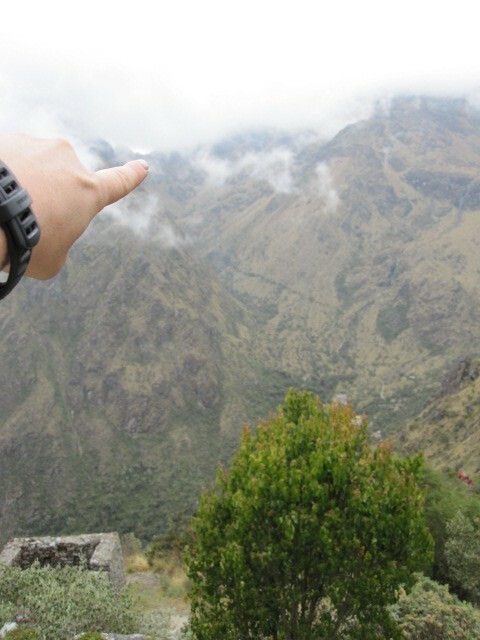 Machu Picchu and its location were impressive—as expected. The trek, however, which covered about 25 miles of elevation gains of up to 13,000 feet at Dead Woman’s Pass and losses and gains again across several passes, was the personally satisfying portion of the trip. The following two photographs show a bit of the extent of this trek: The first, where we were going on Day 2, and the second from the other side while atop the next mountain range still on Day 2. We continued hiking that day. So how did they do it? Without tongues, the only other reasonable alternative to expect was that these runners carried some type of text—a large scroll or a tiny printed words on coco leaf (implausible, but go with me). Well, we’d be wrong in such an assumption. Apparently, the largest pre-Columbian empire built stone cities with precision, expanded their reign across cultures, and managed their empire without a formal writing system. Without a writing system, are texts possible? Are printed or scribed messages possible? In what ways do we communicate without oral language and without printed language? Body language is a possibility. Perhaps chasquis doubled as pantomimes. Perhaps they committed entire building, agricultural and military plans to memory and redrew them—without written instructions—with scale and precision. Could that be exact enough? Other than a linguistic system, could any system of symbols or communication be exact enough? Apparently, yes. In place of written documents, chasquis carried with them wound up strings of various number and color. 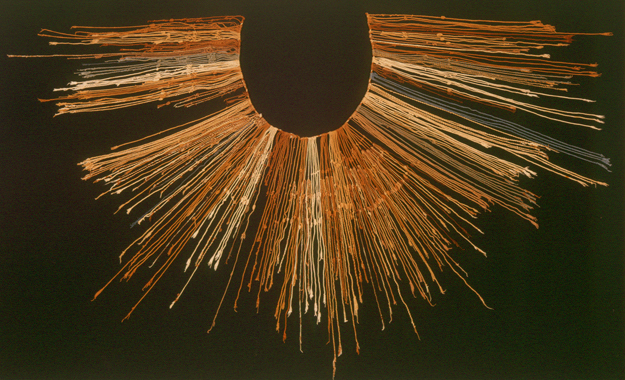 It was on these khipu (Quechuan for knots) that the empire rode. It has been deduced that the various types of knots, positions and string lengths communicated mathematical information. However, much more information was carried in the khipus, as entire histories could be told by a reader of a khipu. Unlike khipus, the readers of khipu are long extinct. At the Khipu Database Project at Harvard University, researchers are working to collect an electronic database of khipus around the world, noting the characteristics of various aspects common across khipus from the final twist and end treatments to the type of fiber and string direction. With this information, researchers hope to one day break this code. With the dominance that speech and writing have on the ways we communicate (as in the example), we often forget the systemized knowledge that we have about other modes of communication. We may not have the knot knowledge of the Incans, but we know that when something is bolded it is emphasized or vectors leading from one concept down to another communicate a sequential or significance order. And this isn’t because bolding means emphasis inherently. Instead, we have—as a large post-Columbian empire, if you will—a series of meanings we attribute to the companion modes of speech and writing. Poem Script from Sudtipos Foundry on Vimeo. Multimodality is not new, but maybe with the increased availability to these companion modes, we can form a new appreciation for the considerations writers should take when composing. Formatting is no longer icing on the cake. Formatting—the color, style and look of the written composition—can begin to be appreciated as inherent to the message much like the type, color and position of a knot on a string once was to the Incans. Previous PostFrom Frames to FramingNext PostTake a Poll on Plagiarism in the Digital Age! The rocky cliffs of Navajo Sandstone that surround my home in Southern Utah are covered with ancient petroglyphs. Their meaning has been speculated upon, over and over. To me they are a fascinating ancient communication. A true testament that writing remains, long after the readers are gone. The need to format communication is powerful. I see it on these rock faces, and in the decorative smart phones that students carry around. The more things change, the more they remain the same. What a fascinating trip and amazing pictures ~ I would also like to know the answer to the codes! This hike is on my bucket list! I heard a topic discussed the other day about an indigenous tribe of people in the South East Asia Oceans, where the head tribesman said there are no words for— want, when or worry. I imagine a life without these words and think it would be glorious. Maybe they are onto something! Keep up your good works…and “words”…you’re an awesome teacher!